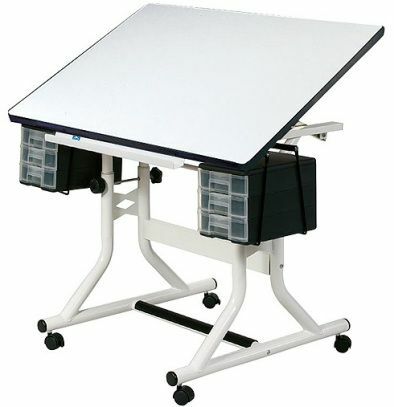 Not just a drafting table, but the ultimate in function, utility and convenience for the hobbyist or artist,the Craftmaster Hobby Station has been designed from the bottom up to meet your creative needs. Outstanding features include:-24" x 40" top with rounded corners for safety. Available in woodgrain or white. Two sets of 3-drawer storage units. 7"w x 7"h x 10" deep-Metal pencil ledge and plastic instrument tray both included. Supplied with locking casters and non-slip floor glides. 166 points will be rewarded when you are logged in to your account and buy this item.